« Does car colour really affect the vehicle’s interior temperature? Recently we heard a story of a lady who had to replace her scooter because she didn’t check her oil levels. As she was driving towards London, her scooter slowly ground to a halt. She had a quick check and ascertained that the fan belt had gone. After several hours of waiting and being towed to the garage, she was informed that not only her fan belt had gone but also the engine. This was simply because the scooter had run out of oil. She’s not alone. According to Check your oil.co.uk 47% of motorists didn’t check their oil regularly enough and 27% of motorist didn’t check their oil at all. She could have easily avoided the costly bill of engine or scooter replacement if she had checked it regularly and as @MilesBetter_GGS says “So many vehicles come to a premature end because of this not being checked often enough”. We’ve touched upon oil checks as part of our Summer check up blog but thought now is the time to go more in depth. You should check the engine oil at least once a month or before going on a long trip. Low oil levels can lead to expensive repairs and in really extreme cases, if the oil level gets low enough moving engine parts can fuse together with the heat! If you want an accurate reading you should ensure that the engine is turned off for at least 5 minutes to give time for the oil to drain back into the oil pan under the engine. Put the dipstick back into the pipe. For those of you who like a step-by-step guide, try watching this video by Comma. Remember that the oil will need to be changed approximately once a year but it’s best to follow the manufacturer’s guidelines. At MEB, we will check and change your oil if necessary at your car’s annual service. 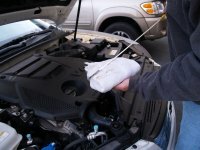 This entry was posted in Uncategorized and tagged advice for oil levels in vehicles, car oil change, checking oil levels, garage Edmonton, garage north london, garages in north london, MEB, north london garage, oil and filter change, oil change, oil change service, oil changes, oil checks, oil levels. Bookmark the permalink. Both comments and trackbacks are currently closed.